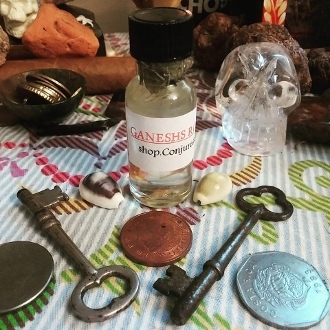 This is a NEW and improved version of my traditional Road Opener oil and my Ganesh oil. Both are quite popular and very similar in recipe, so I decided to try to combine them-the results have been outstanding! I rarely combine oils to "improve" them, as I'm a stickler for the old-time, traditional recipes, but this just made sense! These oils are staples in many hoodoo cupboards and now you can have the best of them combined! Clears away impossible obstacle and tasks quickly and also focuses psychic abilities and aids spiritual matters. This oil is PERFECT if you have someone in your life always demanding that the focus be on them with their dramatic situations. Let this clear the drama from your life so you can focus on the success you deserve!